Dying is a journey. The same can be said of grief. Indeed, a journey is a central image for everyone’s life. We take first steps—onto college, a new job, marriage—and set forth on unfamiliar paths. Maybe we’ll read a self-help book as a “trail guide.” Maybe we’ll listen to the advice of mentors. Maybe, even before a first step, we’ll plot the course of our education, relationships or career, identifying benchmarks to achieve and long-range goals. Planning is good, but most of the time we’ll stumble along. Every “trail” has trials and errors. Oops and Hooray are often said on the same day. Regrets burden us like boulders tucked in a pack. Joys surprise us and lighten the load. On we trudge. On we scamper. Or, in my case, I bring on a labyrinth. 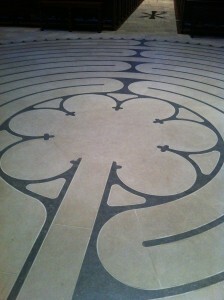 I’ve begun to use the labyrinth as a tool to help people understand their grief. I’m new at this, and mostly wonder how it will go. But I already know one thing: we’re all sojourners, pilgrims with heavy hearts and hopeful longings.